A friend asked me today whether do I read the locally produced Hypertune magazine as he is a big fan of it. My answer to him was a simple NO. "I just prefer something that has a lot less pages but with a lot more substance, that's all." "So what car magazines do you read then? ", he asked. And I told him if he really wanted to know he could read up my blog when he gets home tonight. So my dear friends and readers, if you ever have time to pick up one of those magazines that is shown here, I guarantee it will open up your eyes and horizon and you'll never want to pick up one of those local copies again. A little pricey maybe? Yes, but you get what you paid for. Its all about the quality, not quantity. Not so much into hard copies. Digital media is the way to go :D The internet is full of forums etc and I take my own sweet time browsing. agree, though you can't believe everything you read or you see on the internet. "besides, i rather bring a magazine to the toilet when i need let go a big one compared to my laptop :P"
cant agree with you more man!! 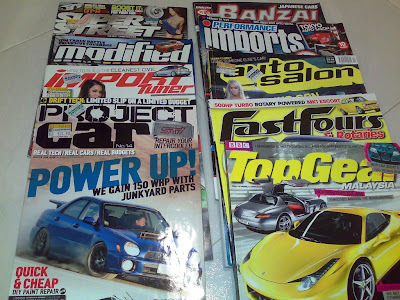 i do buy a lot of car magazine esp when i am travelling. One thing I notice is that most of them have more and more adverts then actual editiorial or article! It wasnt that bad if you check maybe 7-8 years ago. I do however pick up a copy of Hypertune every now and then. They can do with less advertising and better writers la. Also I dont like their concept of "modified cars". Even cars with engine swap is good enough redy for them. This has no engineering value or substance to me, unlike what you are doing to your VIOS!!! Get it started soon man, I want to blag a ride...should be awesome! well said bro, well thats the fact of life. sometimes and we all gotta give in in order to survive. ermmmm...u tell him yourself.. :)cant help u there!!! Well worth the wait if it all comes together nicely in the end bro. Can't wait to feel the TRD SSK man. The suspense is killing me.